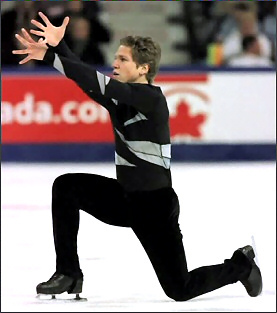 Jayson Denommee won the Canadian novice men's figure skating title in 1994, finished second in junior men in 1996, and won the silver in senior men's in 2001. Canada’s Jayson Dénommée has medalled at the three top levels at Canadian Nationals, but has yet to win the gold medal in seniors although he has placed in the top ten for seven of last eight years, missing only 2000 when he was felled by illness. He’s been in the top five on four of those occasions. Dénommée won the Canadian novice men’s title in 1994, finished second in junior men in 1996, and won the silver in senior men’s in 2001. This season, he finished 7th after errors in the short program left him out of contention. Aljona Savchenko and Bruno Massot are the first pairs figure skating team from Germany to win a gold medal at the Olympic Games (2018 Olympics) since Ria Baran & Paul Falk in 1952. Savchenko also won Olympic bronze twice with her previous partner Robin Szolkowy in 2010 and 2014. More on Aljona Savchenko and Bruno Massot and Aljona Savchenko and Robin Szolkowy in the GS Forum.